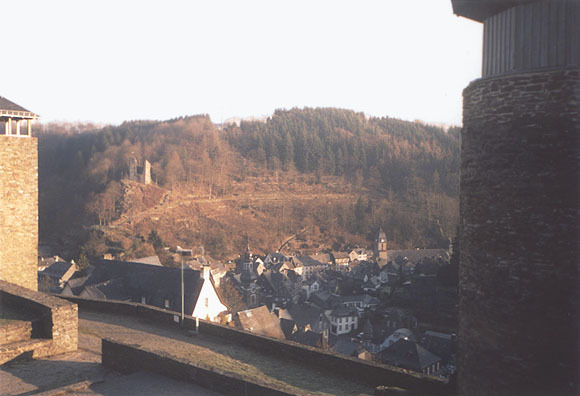 Bouillon is in the south-western Ardennes, very near the border with France. The town is built around a tight loop of the meandering Semois, among the hills and forests. The long castle, built into the rock (and with all sorts of dark rooms and maze-like passage-ways inside), with the river close by on both sides, dominates the whole town. This photo of the town, castle and hills beyond was taken from the youth hostel - it's on the hill opposite the castle, and can be reached by a narrow set of steps running right up the hill from virtually the centre of the town! Monschau is a small town in Germany - however it merits inclusion in this Belgium section as it's a great place to walk to from Belgium. The Hautes Fagnes (transl: High Fens) area is a high moorland and marsh plateau in the east of Belgium, in and around the German-speaking "Cantons de l'est". The region directly borders Germany. I caught the train to Eupen, and walked across the open country to Monschau one day, returning (by a slightly different route) the next day. I stayed at the youth hostel located inside the castle in the centre of the town. It's a fantastic location, way up above the main part of Monschau. The photo on the left is taken from here. The other is taken from a bridge in the centre. 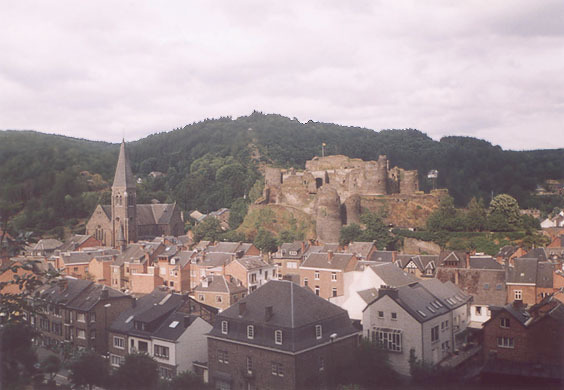 La Roche-en-Ardenne is a touristy town in the centre of the Ardennes. It's built on the banks of the Ourthe. The castle is difficult to see from a lot of places in the centre of the town - it's definitely best to view it from above. La Roche is well placed for some nice walks in the surrounding forests - careful, though - if you've come by train, don't miss the last bus or you'll have a long (25km or something!) way to go back to the station. 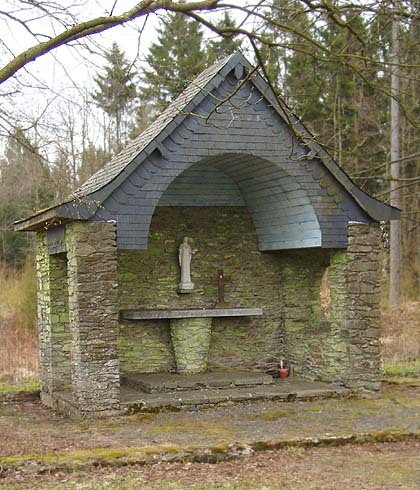 Everywhere you go in the Belgian countryside, there are these small road-side chapels. Some consist simply of a crucifix attached to a tree... others like this have a dedicated building. I found this one while walking near the village of Porcheresse, in a very quiet part of the province of Luxemburg in southern Belgium. The map calls it Chapelle Minire, though as with most of these chapels, I have no further knowledge of when or why it was put here. Porcheresse itself is a fascinating village. In 1914, it was almost completely destroyed during the war. The church, school, castle, mill, archives and two thirds of the houses were burnt down. 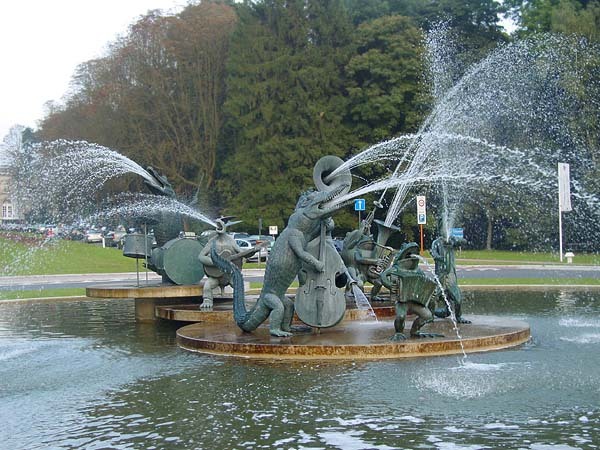 Every year, one Sunday in May, the opening of the "Avenue de Tervuren" is celebrated. 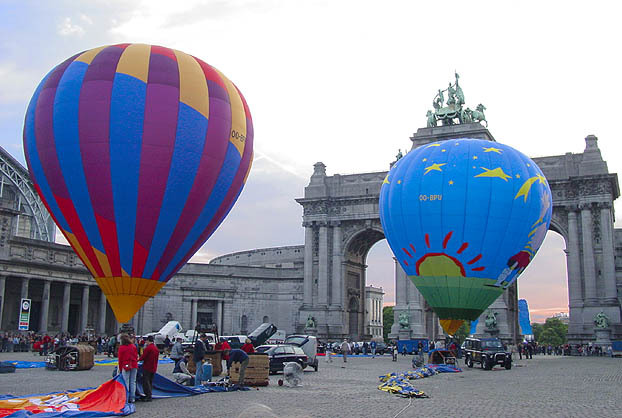 The road is closed to motor vehicles from Merode / Cinquantenaire Park right down to Woluwe Park, and fair stalls, sports, games and of course bars, frites and waffle sellers are set up all down the road. Pedestrians, cyclists and roller-bladers fill the road. 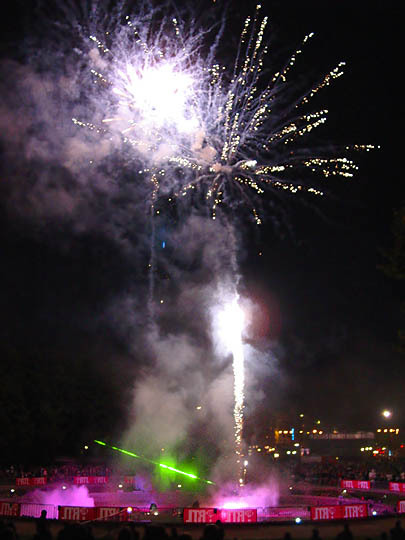 I took this photo at the Son et Lumiere and Fireworks display held later in the evening in Cinquantenaire Park in 2003 (the 106th anniversary of the opening). It took place in the east of the park, above the pool. 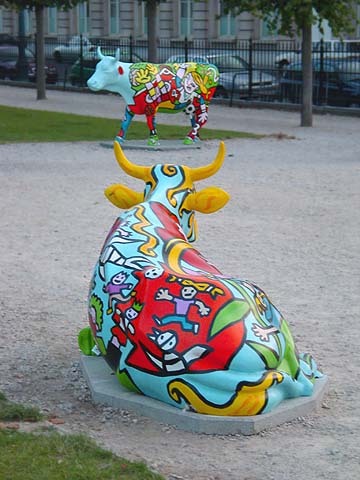 Brussels was home to a 'cow parade' in 2003 - hundreds of sculpted and painted cows were placed around the city. The cows were all designed by different artists, so each had its own style. Here are a couple in the park. All the cows were later auctioned off for charity. 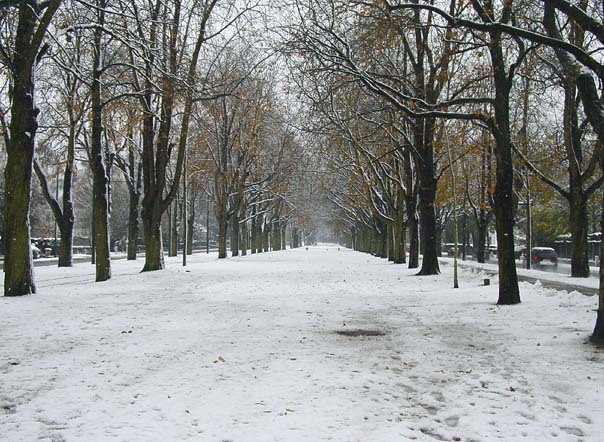 Winter 2003-2004 saw one morning with loads of snow cover. 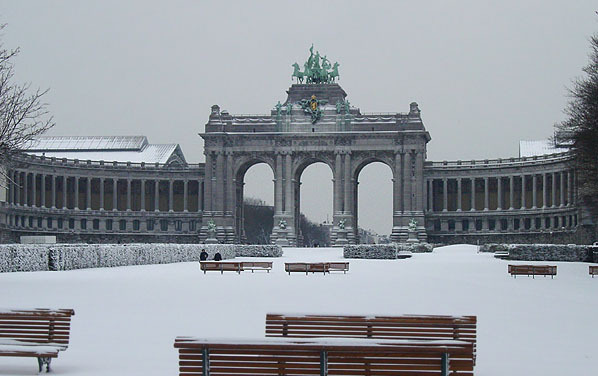 The picture on the left shows the arch in the Parc du Cinquantenaire / Jubelpark. 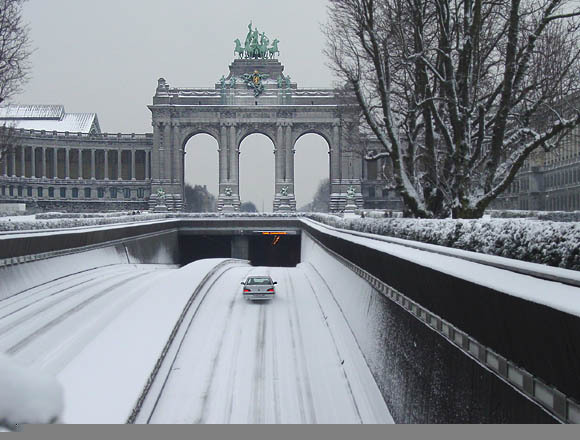 The road tunnel under Cinquantenaire was virtually deserted. Normally at this time in the morning (about 8:45) it'd be packed. This time, only the bravest drivers made the slow and solitary journey through it. 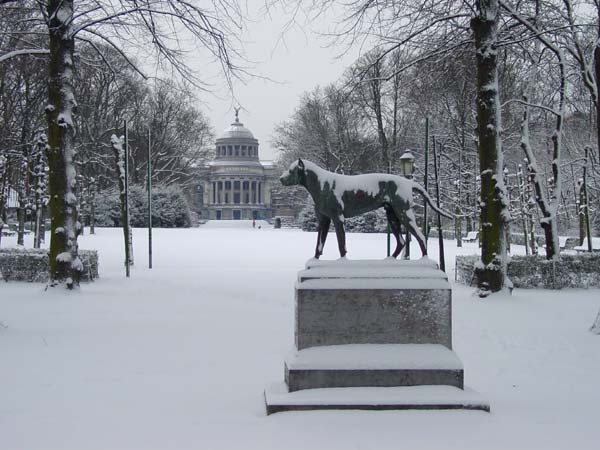 The picture on the left shows a snow-covered sculpture of a dog in Cinquantenaire - with one part of the museum of art and history in the distance. 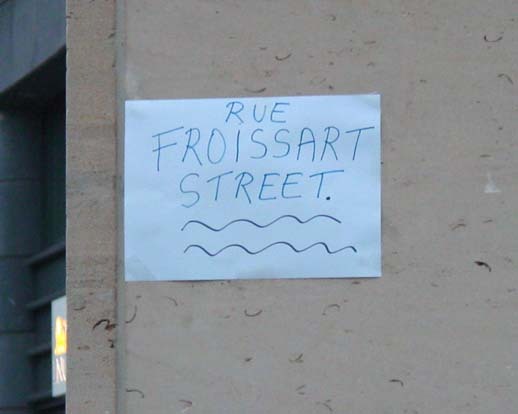 In the absence of a proper street name sign, somebody put up this substitute! This is where Rue Froissart leaves the Schuman roundabout, in the heart of the EU district in Brussels - both the European Commission and the Council of the European Union (Council of Ministers) have their offices here. So the replacement of the standard Dutch 'straat' for the English 'street' is a nice touch, I think! 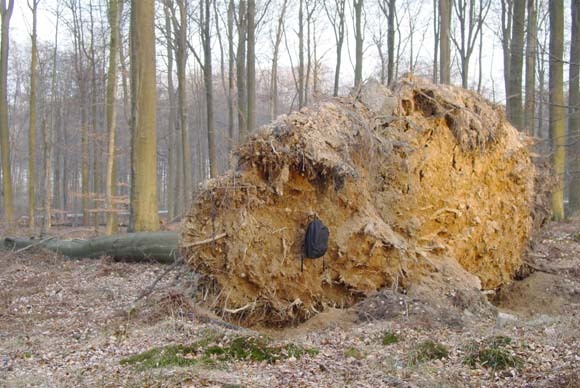 The photo on the left shows a tree which has been uprooted. It's pretty large, I reckon - to give an idea of scale, that's my ruck-sack hanging on the base. 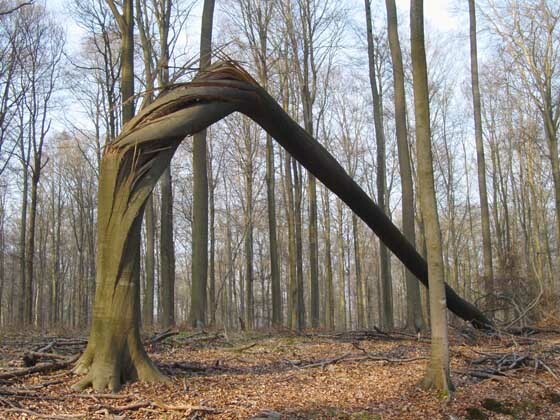 Whereas trees like the one above are uprooted, the tree in the photo on the right has simply been snapped, just as if it were a matchstick. Both trees are in the Forêt de Soignes / Zoniënwoud - the forest on the eastern & southern edge of Brussels. 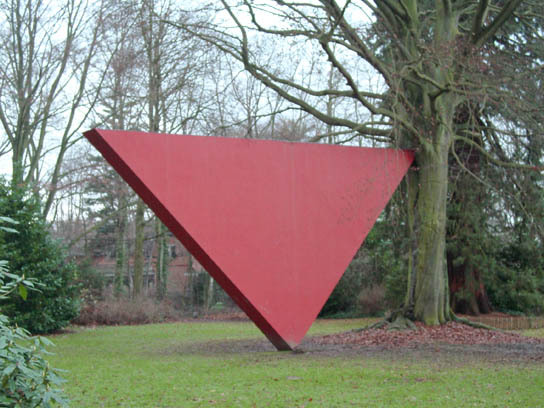 It's a big upside-down red triangle in Tournay-Solvay Park, Brussels. 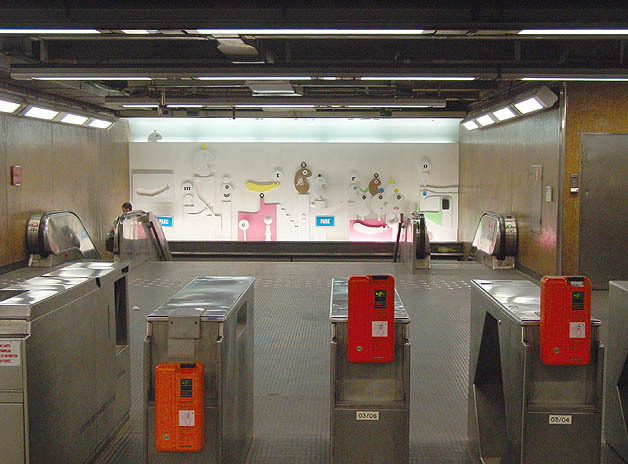 The majority of metro stations in Brussels feature one or more 'Art in the Metro' works, many of them made by notable Belgian artists. Here's the work in the entrance of the Parc / Park metro station. The Flemish town of Halle lies a little to the south of Brussels. 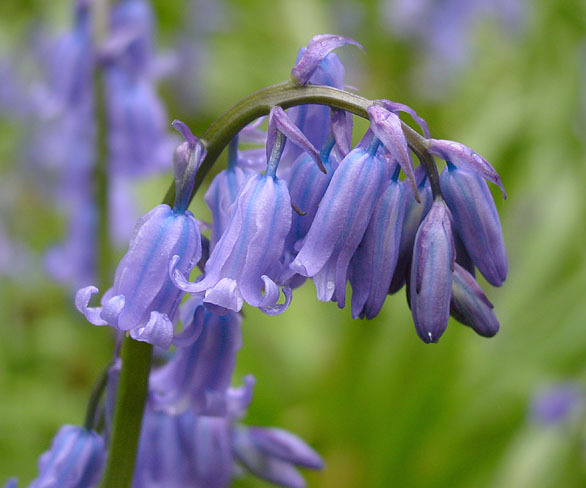 Just to its south-east is the wood which bears its name - the Hallerbos, or Bois de Halle. 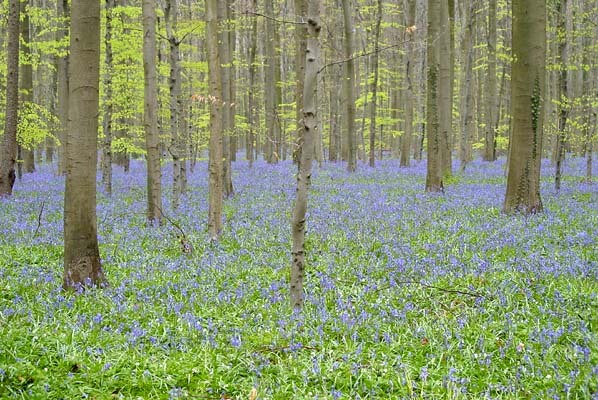 For a few weeks every spring the Hallerbos is completely covered by an immense carpet of bluebells, creating an impressive spectacle. 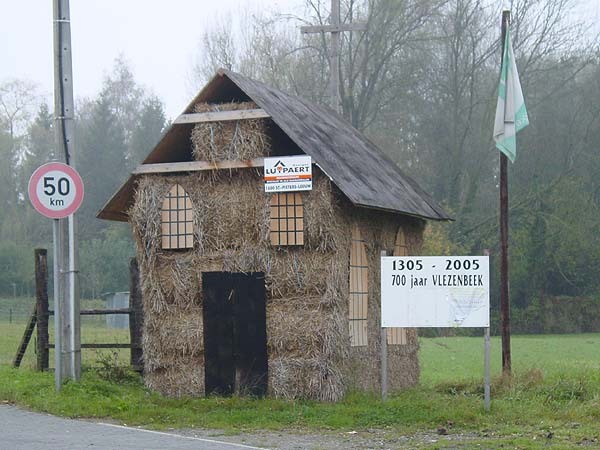 Here's a chapel made of bales of hay, to celebrate 700 years of Vlezenbeek (a village west of Brussels, in the area known as the Pajottenland). No, I'm not sure why either. 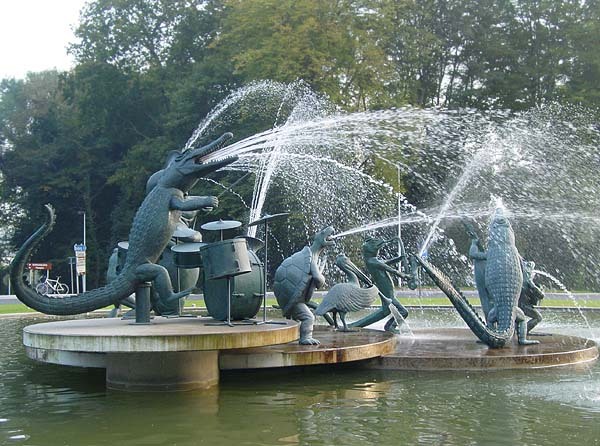 This band of animals greets you as you arrive in Tervuren from Brussels. It's in the middle of a roundabout. In the middle of the Tervuren Park to the east of Brussels, 12 or 13 paths join together at one junction, called the 'Zevenster'. I put together a 360° panorama from a number of photographs I took one day in spring 2004. 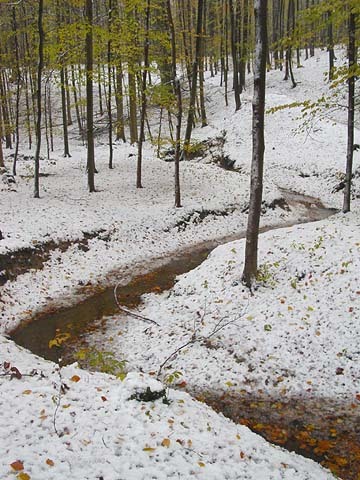 November 2005 saw snow arriving particularly early in the season. Conveniently, it mostly came on a Friday night, giving us a nice snowy weekend. 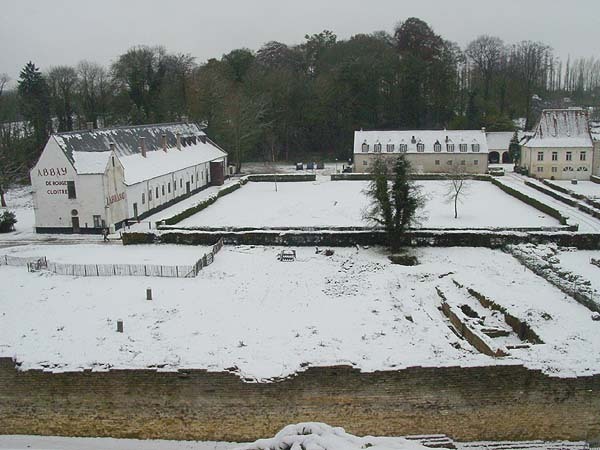 Here's the normally grassy centre of the Avenue de Tervuren, and the Abbay[e] de Rouge Cloitre, nowadays a cultural and exhibition centre. I walked east from the Avenue de Tervuren footbridge near the Woluwe Park (see the picture on my Brussels Landmarks page) to the Foret de Soignes, the location of this stream. 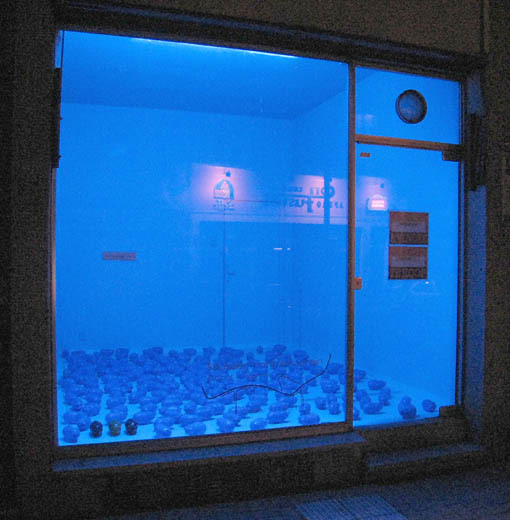 Near the Etterbeek town hall, this shop window shows changing art displays, all of them bathed in blue light. 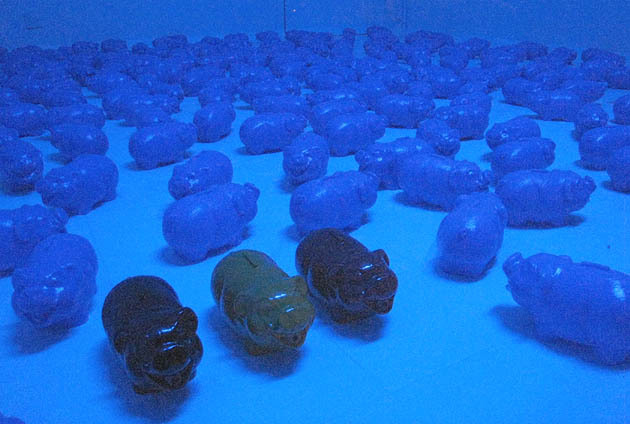 This one consists of many pigs, most of them blue with a Belgian-flag-coloured trio in front. The explanatory label reads simply "Savez-vous combien de ministres nous avons en Belgique? ".